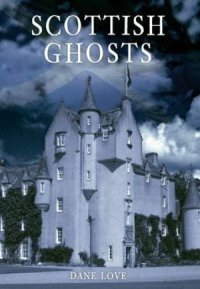 You can buy Scottish Ghosts direct from the author on his online Bookshop. You can also buy this book from Amazon by clicking the link to the left. Scotland is a haunted nation with hundreds of ghosts frequenting buildings old and new. It is also a land of castles and virtually every one seems to be haunted. Yet country houses are haunted too and even small private houses located in the midst of housing estates have ghosts of their own. There are haunted battlefields, mountain spectres, Viking longboats, ghostly vehicles and bouncing cannonballs. Many ghosts are victims of love triangles, others were soldiers killed in the line of duty. There are ghosts in: hotels, theatres, factories, churches, barracks, aerodromes and on beaches. In their earthly lives the manifestations have been anything from Tahitian princesses and Scottish queens to sailors, singers, dogs and monkeys! Also, Scotland seems to have more sightings of the well-known 'green lady' than any other country. The story behind each haunting, sighting and occurrence at over 250 locations is told in fascinating detail. An irresistible book. This is a new edition of the original book, information on which can be found here.